Though the storm has departed, the crisis remains as flooding continues and rescue and recovery efforts will go on for weeks and months to come. To-date, there are over 40 fatalities, an estimated 4 million deceased livestock, over 143,000 people out of power and over 10,000 people displaced in shelters. 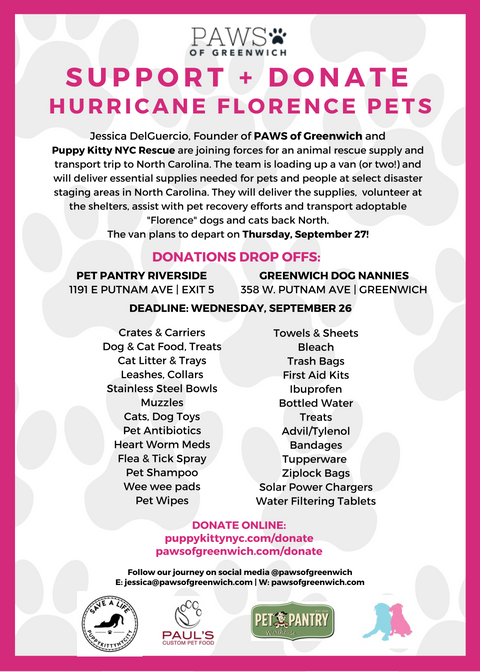 — Jessica Del Guercio, Founder of PAWS of Greenwich. There are two ways you can help: donate supplies or help pay for expenses. Donate Supplies: Supplies, gift and gas cars can be dropped off at the following donation locations, by noon, next Wednesday, September 26. Paul’s Custom Pet Food will also be collecting donations and supplies THIS WEEK at the following farmers markets: Old Greenwich Farmer's Market; Westport Farmers' Market; New Canaan; Farmers Market and Down to Earth Markets in Larchmont. Make a Monetary Donation: Monetary donations are needed to cover cost of the trip: rental van, gas, hotel, food, purchase of personal supplies and well as purchase of needed supplies. Requested items for pets and people include: dog/cat food; leashes; crates; pet medications and medicated shampoos; flee/tick medication; first aid supplies; cleaning supplies (bleach); trash bags; portable generator; solar powered phone chargers; batteries; towels and blankets, etc. Follow their mission on PAWS of Greenwich Facebook Group, and Instagram.